Precious metals turned down Wednesday. 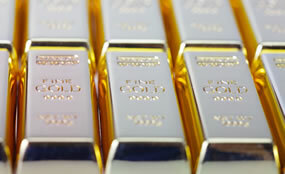 Gold futures ended at just over a one-week low while silver futures settled to a more than two-week low. Gold for December delivery fell $10.40, or 0.9%, to close at $1,167.10 an ounce on the Comex division of the New York Mercantile Exchange. The settlement was the lowest since Oct. 13 when prices ended at $1,165.40 an ounce. "Gold prices ended the U.S. day session lower on some profit-taking pressure Wednesday, following recent gains," Jim Wyckoff, a senior analyst at Kitco Metals Inc., said in a report. "The key ‘outside markets’ were also in a bearish posture for the precious metals today, as the U.S. dollar index was slightly higher and crude oil prices were lower." Gold prices traded from a low of $1,163.20 to a high of $1,179.30. Prices turned up 0.4% on Tuesday. Silver for December delivery lost 21 cents, or 1.3%, to end at $15.71 an ounce. The settlement was the lowest since Oct. 5. Silver prices ranged from $15.68 to $15.94. They gained 0.5% in the previous session. January platinum declined $13, or 1.3%, to $1,007.10 an ounce, trading between $1,002.20 and $1,024.70. Palladium for December delivery dived $17.70, or 2.6%, to $677.15 an ounce, ranging from $672.60 to $697. Gold fell $10.65, 0.9%, to $1,167.10 an ounce. Silver fell 11 cents, or 0.7%, to $15.75 an ounce. The United States Mint registered a day of wide bullion gains with sales of all but one of its products advancing. Gold coins climbed 2,500 ounces and silver coins moved up 186,500 ounces. The U.S. Mint has limited sales of bullion American Silver Eagles since temporarily running out of them in early July. The agency allocated 970,000 coins for this week, and now 84,000 of those remain. On Wednesday, Silver Eagle sales totaled 38,945,500 coins for the year — a record pace, up just shy of 8% through the same time in 2014. Last year when sales ended at an annual record totaling 44,006,000, the coins by Oct. 21 reached sales of 36,066,000.